The latest model from Privateer is a clever twist on the trawler yacht concept, as Jack Haines has been finding out. 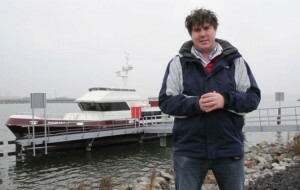 In this video, our boat test editor heads to the Netherlands to explore the usual layout of the Privateer Trawler 65. The first thing to note is the lack of a traditional cockpit, as the owner opted to extend the saloon right out to the transom. This has a knock-on effect, meaning that aft flybridge access comes in the form of a ladder that stretches all the way up from the bathing platform. However, Privateer didn’t stop there and added an internal staircase, which makes for easy communication between decks. Another notable feature, one that Jack particularly appreciated in the bitter winter’s cold, is the underfloor heating that is fitted throughout. To take a closer look at the Privateer Trawler 65, click on the video above. And to read Jack’s full review, pick up the May edition of Motor Boat & Yachting, which is out on Thursday (April 2).